Well, I am very overdue for a blog post! A lot has happened in the past 2 weeks – a nightmare with Easy Jet, a canceled trip to Paris, Thanksgiving, and my trip to London…oofta. A) case of fraud is impossible. I bought the tickets myself, for myself, with my own bank card issued to me in my name, through the Easy Jet official website. B) i had not been notified there had been a problem whatsoever. Easy Jet never contacted me with a problem – no email, no phone call. C) my money had not been refunded (and to date, still has not been). They had taken the money from my account, but I certainly would have noticed if they had put money back in. D) They told me I could buy a new ticket to Paris, the next flight leaving at 5pm, and I would have to pay in cash. E) I now was not going to Paris, thanks to Easy Jet’s mistake, and my friend Kate was going to have to spend all weekend in Paris by herself. F) They had canceled my tickets to London as well. I was trying not to lose it and just break down crying because I was so frustrated and purely livid with them. I managed to maintain some dignity – I didn’t make a scene, but it was very difficult not to. I was a storm of indignant rage – ready to lash out on anyone who looked at me the wrong way. I managed to email the hotel and send Kate a Facebook message that I wouldn’t be coming to Paris. I had a miserable ride back to Cannes, walked back in the rain, and spent most of the rest of the weekend trying to overcome the depression of being in Cannes instead of Paris and my rage toward Easy Jet. The next ordeal was trying to call the Easy Jet line to get it sorted out. I tried right away when I got home from the airport to call the international number on the phones here at the college – but the international number doesn’t work! They can’t get anything right. I thought it may be the phone too – so I asked Beth (our director) if I could use her phone to call. I used Beth’s phone to call the next day – the international line still didn’t work, so I tried using the French line since it is cheaper than calling the UK line. Unfortunately the phone kept dropping the calls – and the farthest I got was telling someone my confirmation number when the phone ran out of credit. Beth was nice enough to put more credit on the phone for me to try again…but it still kept dropping the calls. Soooo we went to Beth’s apartment to try her landline. The landline worked much better – but I first called the French line and the woman was not cooperative and I think some things were lost in translation because she was not understanding my problem, and kept telling me I would have to request my refund online. After many more angry tears, I called the UK line. This went better – but they still didn’t fix the problem. At least the guy on the other end of the line was sympathetic, but he didn’t have access to the information as to why there had been a problem in the first place. He said he would send my case back to the people who decided it and my money would be returned to me in the next few days…and now it’s a week later, and I still don’t have my money back. I have to gear up for another angry phone call tomorrow demanding my money back. Suffice it to say, I HATE EASY JET. The thing that is the most ridiculous is that this is entirely their fault and yet they are not taking any responsibility. They’ve screwed me out of two trips and are doing nothing to rectify that. I’m still bitter that I wasn’t able to go to Paris for a second time, and that I missed out on showing my friend all the things I love about Paris and France. *Obscenity* you, Easy Jet! I still wanted to go to London though – I wanted to get at least one trip out of this ordeal. The only problem was, now that London was only about 5 days away, it was difficult to find tickets that weren’t outrageously priced (which is why I had bought them over a month ago…). I had 3 essential criteria: 1) needed to be 250 euros or less. 2) NOT with Easy Jet. 3) that I would be able to get to/from flights via public transport. It was stressful – but I managed to book a flight with Swiss airlines, and I would have Friday night-Monday morning in London! WOO! The rest of the week was pretty good – and Thursday was Thanksgiving! 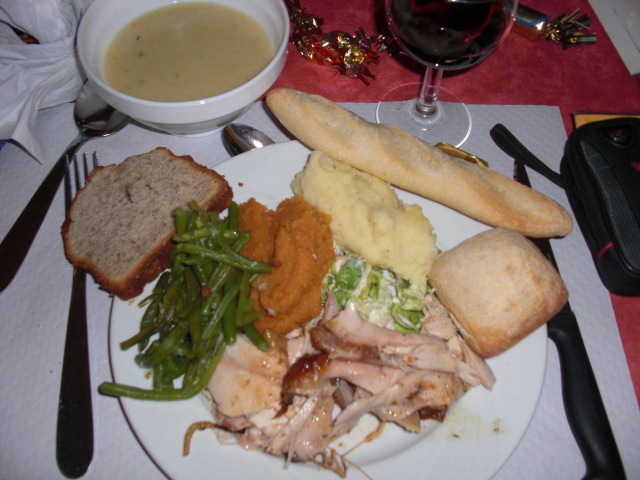 The Collège was very accomodating for our American holiday and made us a Thanksgiving feast. For dinner, all of us Americans dressed up for the feast and I was pleasantly surprised by both the Collège’s effort and the meal itself. They had set up all the tables in a giant U shape with new table clothes, wine with wine glasses, and candies on the table. 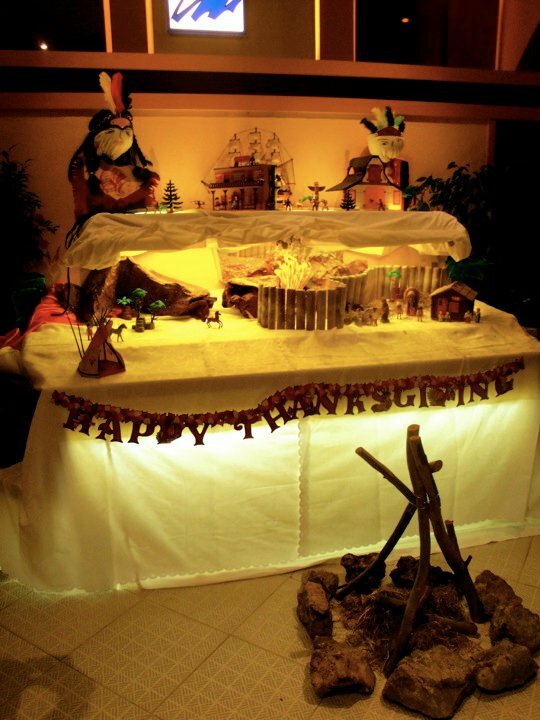 The French interpretation of this holiday is a little different from home – they had decorated with a playmobile scene of pilgrims and indians, a teepee, and an american flag. I thought it was all very cute! The meal was similar to the menu at my house, but certainly not as good as mom’s cooking! There was waldorf salad, corn chowder, turkey, mashed potatoes, sweet potatoes, cranberry sauce, green beans, and an assortment of breads. There was also dessert of pecan and pumpkin pie – though it looked nothing like our version of pumpkin pie! It didn’t look very appetizing, and someone else told me it tasted like the inside of a pumpkin. I had a great time at dinner, and there was karaoke in the foyer afterward. I also got to skype with both Karl and the family – it was a great day! I really wish I could have been home though – that’s one of the best holidays and it’s definitely not the same away from your family! Dinner - YUM! Not as good as Mom's, but still good! I didn’t spend too much time at karaoke though, because I had to pack for London! I made it through grammar class before I had to leave for my flight – and I had a level of paranoia that something was going to go wrong again, since the last time I tried traveling resulting in a canceled ticket without my knowing. It went fine – I had a layover in Zurich, and I saw snow there for the first time this year! I was on my way from Zurich to London City airport, and we were reaching the time we were supposed to be arriving…and the pilot announced that there was a technical problem and we would have to fly into Stansted instead! 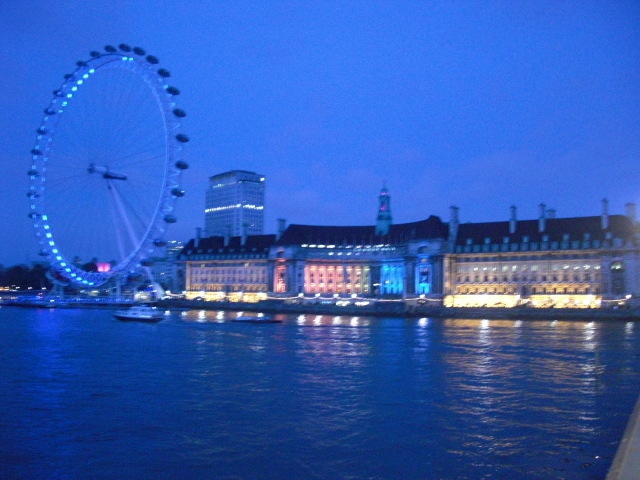 Stansted is about 45 minutes outside of London, and London City airport is in London city center. This wouldn’t have been a problem…except that Kate would be meeting me at London City airport, and I didn’t have her phone number (if she even had a phone, I didn’t know) or her address! Hmmmm this was going to be interesting. The guy sitting next to me was really nice though, and he offered me his phone to call someone. When I explained that I didn’t know her number, he told me it was a blackberry and I could use the internet to send them a message instead. So, I wrote her a message on Facebook, since that’s how I alerted her that I wouldn’t be coming to Paris and she got the message. Swiss airlines was supposed to be putting together a bus that would bring us to London City airport, so I told Kate I would take that and would meet her there. It was Kate! I don’t know how she found me – it was incredible that she was in the Liverpool underground at the same time I was. I thought she was still at London city airport! Apparently she had sent me another message saying she would wait for me in Liverpool St station for the Stansted express – an express train from the airport, but I never received the message! She had waited for about 4 or 5 trains before deciding to just head home and trust that I would make my way there. It was such a great moment – still can’t believe we found each other like that! Thank God. 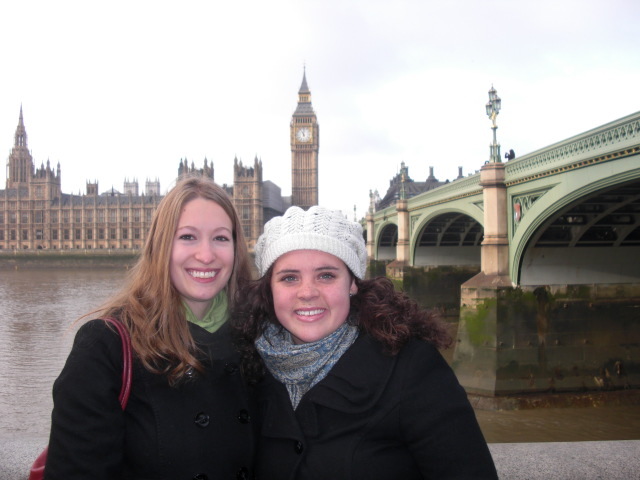 We headed to the flat and Kate showed me around and introduced me to her many flat mates, all other CSB/SJU students on the London program. Their group is huge compared to mine – 25ish students compared to our 10. Everyone was really nice and hospitable, and I was more than happy to have a free place to stay! We had a little pasta for dinner and hung out for a little while before going to bed. The next day, we got up and had a little breakfast before heading out to see the town! I was freezing – London is way colder than Cannes. Cannes is about 50 degrees and sunny, while London is 30 or less and cloudy. Luckily, Kate had some extra mittens to lend me, which helped a lot. 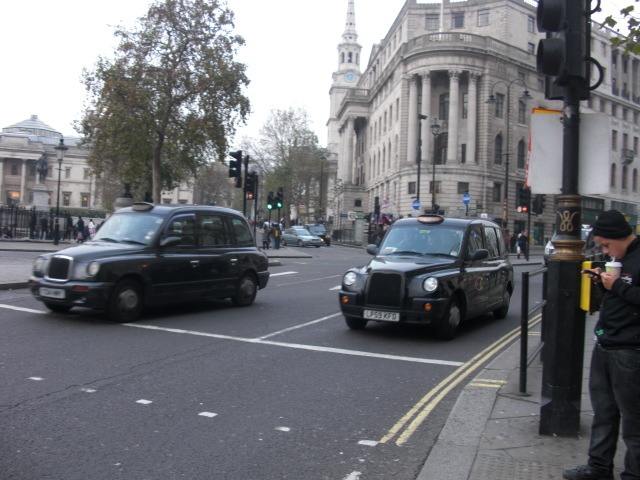 We had a really busy day walking around most of London – it’s much bigger and more spread out than I thought. 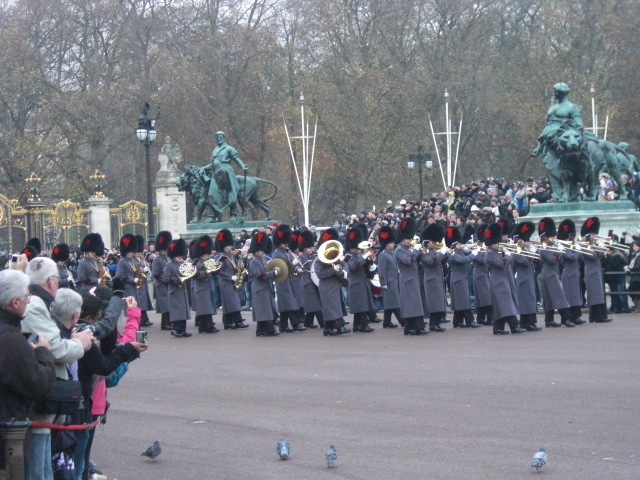 We started off at Big Ben and the Parliament buildings, the London Eye, a Christmas market, some street performers, some gardens, Buckingham Palace (and even witnessed a changing of the guard!) and Covent Garden before we stopped to have some fish and chips! It was delicious, at one of her favorite hole-in-the-wall restaurants. 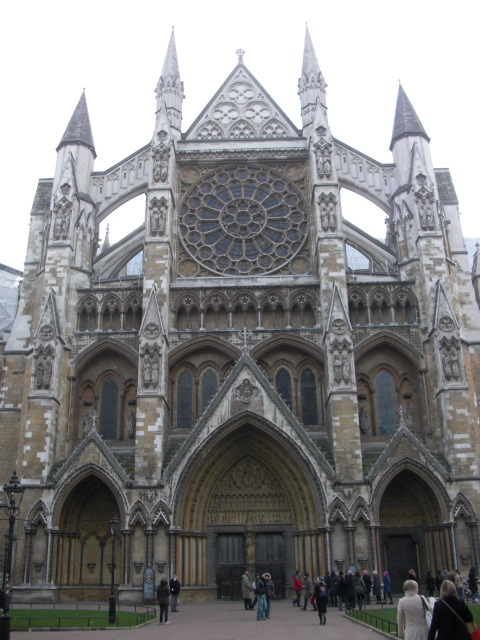 We stopped by Westminster Abbey afterward, but unfortunately visiting hours were over by that time so we couldn’t go inside. We also went the National Gallery (saw Van Gogh’s Sunflowers there) and then stayed there for some afternoon tea! 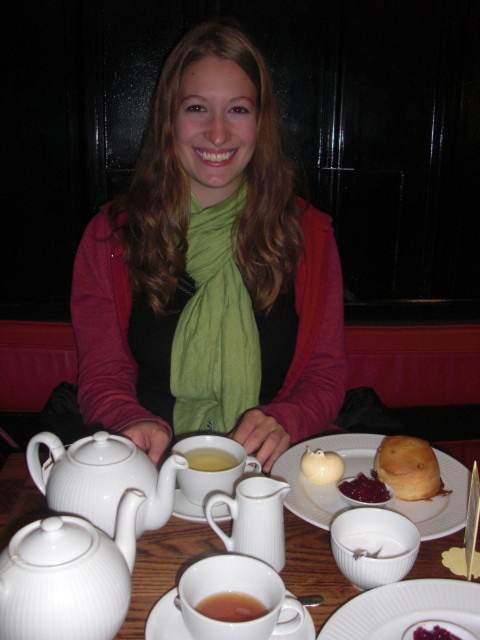 It was great – a whole pot of tea, and one of the most delicious scones I’ve ever had with raspberry jam and cream. I loved it, and felt so British! 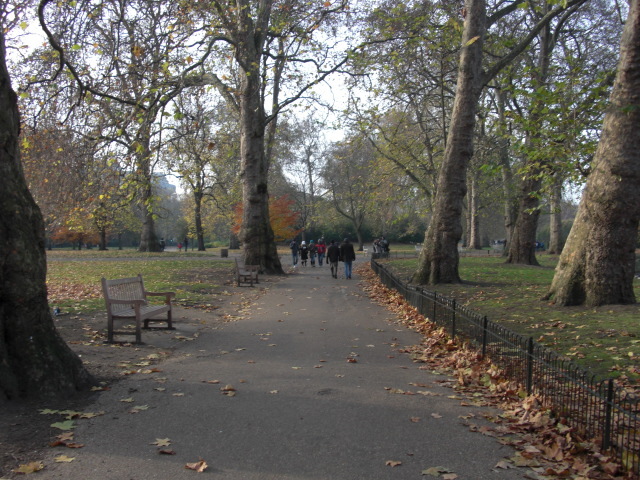 We walked through some more parks and markets, and I was loving the British ambiance. 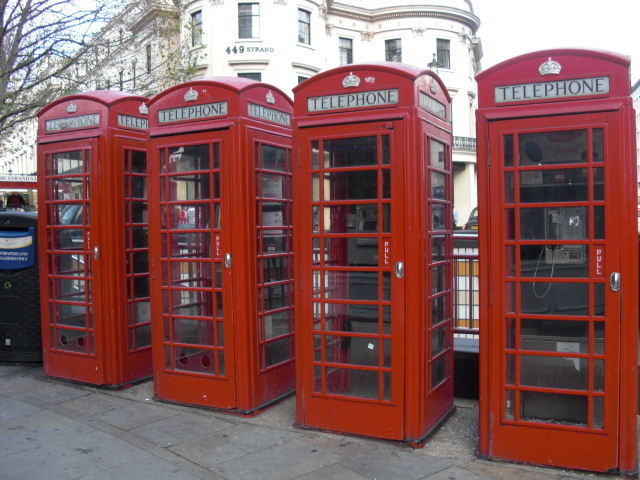 The telephone booths, the double decker buses, the “look right” and “look left” printed on the street, the British accent, the underground, tea, Big Ben – it was great! We had dinner at a little Italian place and had some delicious pasta (with a hilarious waiter who kept making little mistakes and swearing) before some of us went to Hyde Park for Winter Wonderland! It was a cute Christmas kind of carnival – lots of lights, food, market stalls, and rides! It was a lot of fun to see, and definitely put me in the Christmas mood. We didn’t spend too much time there since it was cold, and warmed up at the flat watching a little bit of Sweeney Todd on the tele before we headed off to a pub for a drink. It was a cute little pub a couple of blocks away from the flat – it was nice to be having a drink in a real British pub! The next day, we woke up a little later than we had planned, and started off the day at the Portobello market – a really long street filled with shops that set out their goods for the market. It was a cute knick-knack kind of market and we wandered that for a while before we stopped at Charlie’s cafe for some lunch. I had a great BLT and there was a group of 5 people speaking in French next to us! 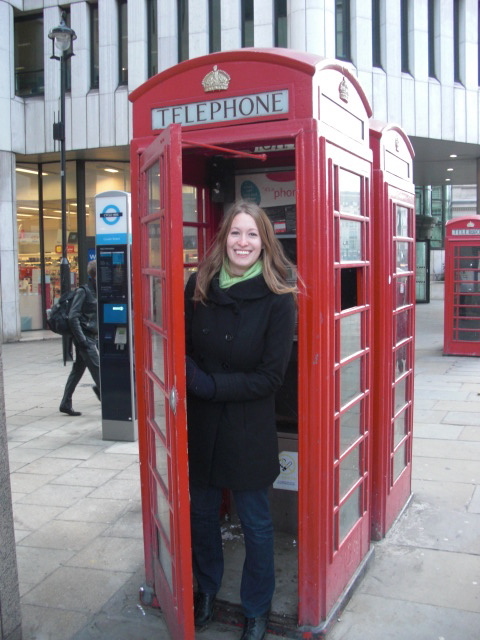 I was eavesdropping a little bit…but I actually heard quite a few French speakers throughout my time in London. Then we were off to the Tower of London! It was very impressive, and we managed to get in free! One of Kate’s flat mates had a museum pass and we got to use it to avoid paying the 17-pound admission fee – score! The Tower was very cool, full of history as it was previously a castle, palace, and prison. The traditional guards give the tours (nicknamed beefeaters) and we had a pretty lively guide. Apparently there has been executions at the Tower in every century except this one – the most recent execution was in the 1940s. 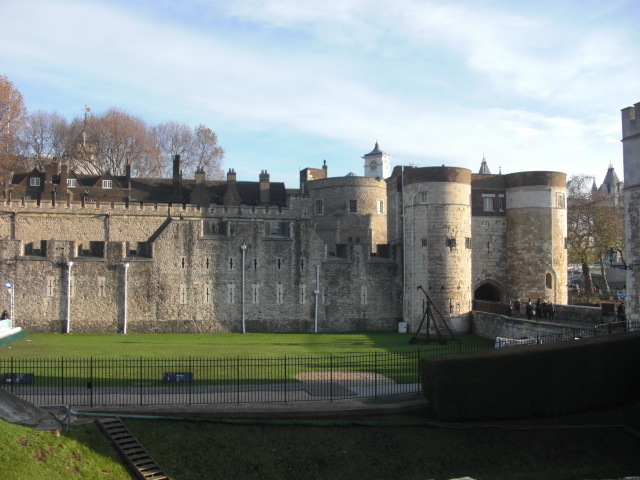 Some really famous people lived or were held in the Tower – Henry VIII, Anne Boleyn, Sir Walter Raleigh, Guy Fawkes, Rudolf Hess, and more. It also houses the crown jewels – which includes the biggest diamond in the world! They were incredible. 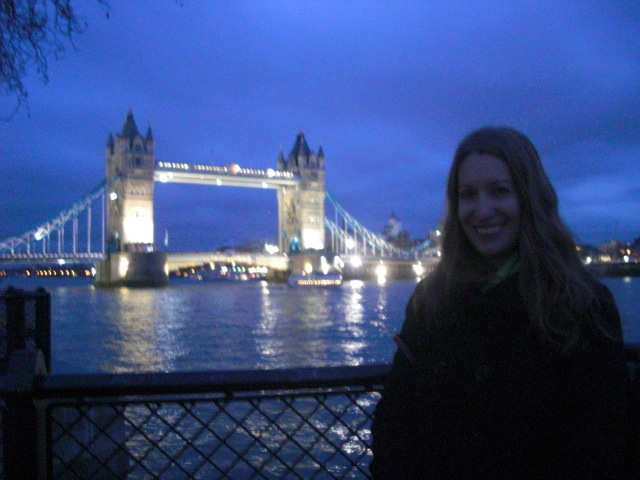 It was already dark by the time we were done touring the Tower (even though it was about 4:15pm) so we took a few pictures of us and the Tower Bridge before we headed off to a huge souvenir store called Cool Britannia. They had so much stuff there! I got a London mug (which will sit nicely next to my Paris mug), some postcards, and something Arsenal for Matthew (though he’ll have to wait til I get home for me to give it to him!). On our way back to the flat, we stopped at an adorable little bakery, the Hummingbird Bakery, for some cupcakes! They were some of the best cupcakes I’ve ever had, especially one that had some cheesecake in it! YUM! We hung out for a little while before heading off to dinner at the Churchill Arms – half classic British pub, half Thai restaurant. Interesting combination, but the food was great! Kate and I split our dishes – a spicy green chili dish and a mild thick noodle dish – they were both great, cheap with huge portions! The rest of the night was spent hanging out and packing. 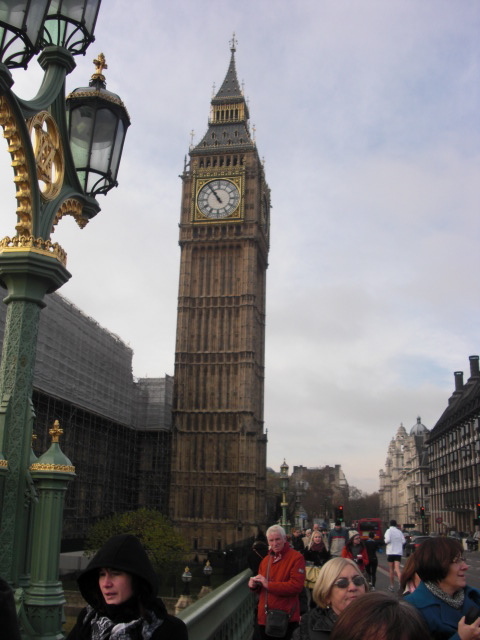 I wish I had more time in London! It’s such a great city and I didn’t even make a dent in all there is to see. I was really lucky to have a friend living there though – she was a great hostess! It’s also sad that was my last trip around Europe…and I realized the next time I will be at the Nice airport will be to come home on December 11th! It’s very bizarre. I am excited to go home, but I will miss France and Europe a lot. 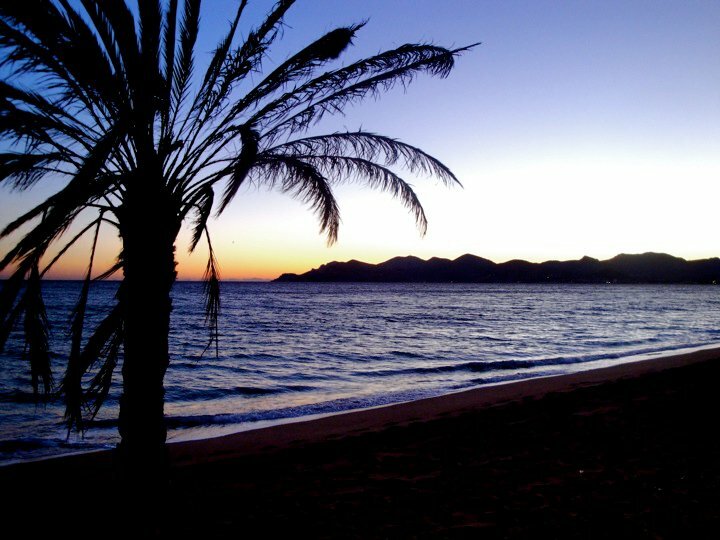 One of the things that makes it so sad is that I know it will be a really long time before I will be back here – nooo! I really can’t complain since I still have India waiting for me…but still. I love Europe and how accessible it is and how many different things you can experience in such a small area. It’s less than 2 weeks until I’ll be home…bittersweet. What a great time, and I have enjoyed following your adventures. I know your mom will be happy to see you. I can not wait to hear what you have in store in India for you. Take care and have a safe trip home.